All the signs are there. Fast food wrappers, cell phones, toiletry kits, children’s toys, recorded books and dozens of other items. A vehicle’s standard inventory tells it all—we live in our cars. Since two out of five Americans professes to gardening as a primary hobby, it shouldn’t be surprising that spades, pruning tools, plant identification texts and earth-stained gloves are commonplace in cars. That basic kit allows the average gardener to lend a hand at the in-laws or the subdivision entrance, and take advantage of roadside floral events. For an increasing number of horticultural enthusiasts, that basic kit isn’t enough. Approximately 5,500 Master Gardeners are active in Michigan at any one time, volunteering about 200,000 hours a year at parks, schools, civic areas, farm markets, demonstration gardens, hospital therapeutic gardens and more. Other such programs enlist gardeners in growing and almost uncountable numbers – 350 official volunteers at The Detroit Zoo, for instance, are adept at sweet-talking family and friends into packing the necessities and meeting up at the zoo for a day of gardening. These are serious gardeners on wheels, packing garden carts, plants, mulch and assorted power tools. That makes the car the ultimate garden tool. So of course some people have begun to seek, design or wish for the deluxe model. Others use ingenuity to turn everyday wheels into garden hybrids. And some must work undercover to take their passion on the road. 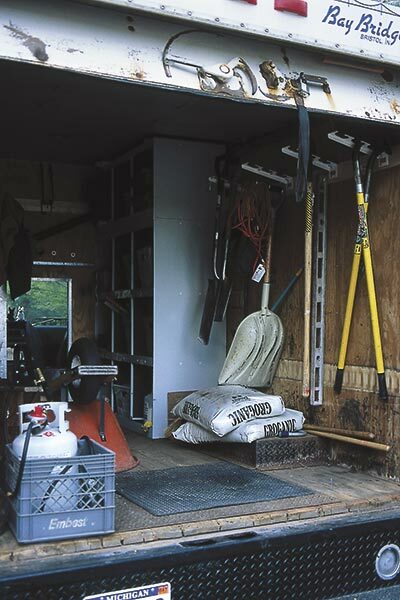 Deb Hall spent several days installing shelving and hardware for storing tools and materials in her cube van. Her system leaves plenty of room for a wheelbarrow, bagged materials and plants. The van is the envy of all her gardening friends. “I love it!” says Hall. Brenda Sutton of Redford takes her gardening skills on the road several days a week and likes to be ready for everything. She considers what to take along each day, which revolves around some “regulars,” tools that can be used for most basic chores—spade, garden fork, trowel, pruning shears and a weeding tool. Although the Saturn’s back seats can fold down, making room for long-handled tools, the cargo space still won’t handle a wheelbarrow. That’s why Sutton includes a five-gallon bucket and a small tarp on her list of regulars—together they can take the place of a wheelbarrow. Judy Jacobs of Franklin trundles tools and supplies around the Detroit Zoo in a red wagon. That’s not unusual among the adopt-a-gardeners, but it is unusual that all of Jacobs’ gear arrives at the zoo in her convertible. Not a car most people would want to see exposed to the elements, so to speak. Cardboard boxes that can be folded flat when not in use are handy accessories. Flattened, they can line a trunk or interior to keep it mud-free beneath plants or tools. They can also fit vertically next to tools to prevent gouged interior molding. Boxed, they can hold several potted plants to prevent tipping. One or two disposable rain ponchos take up almost no room in a glove box or trunk, are always handy for the gardener, and can double as seat protectors under plants. Elastic tarp straps also take up very little space but are indispensable for securing items that might shift. Thick string is a great asset. It can stabilize loads and, gently used, can wrap around and compress plant crowns to half their actual size, or less. If you put in a water garden with a flexible liner, save the scraps of liner. Bigger bits are excellent for lining a trunk and small scraps, placed between stacked bags of mulch or soil, create a non-skid surface to reduce the chance that heavy bags will slide onto adjacent plants. A wide plastic spackling knife is useful for scraping tools clean before packing them back into the car. Old canvas and cloth tote bags can be slipped over the blades of metal tools to prevent scratches to a car’s interior and to catch flaking dirt as well. Used this way they also muffle the telltale metallic clanking. Open the windows if you must leave the car when it’s loaded with plants or bagged materials, to prevent condensation on interior surfaces. In standard cars, load very heavy things first, pushing them toward the front of the vehicle to avoid weighing down the car’s back end. In a truck or bigger SUV built to handle heavy loads, put the weightiest things in last so you won’t have to slide them so far to unload them. “I really enjoy my little car but I also need to take my garden tools around town – to my kids’ homes, the zoo, and to places where I work as a garden coach. So I took a good look at what I needed and worked out this system,” explains Jacobs. “With the top down and a tarp on the back seat, I can load the wagon and tools without leaving a mark. 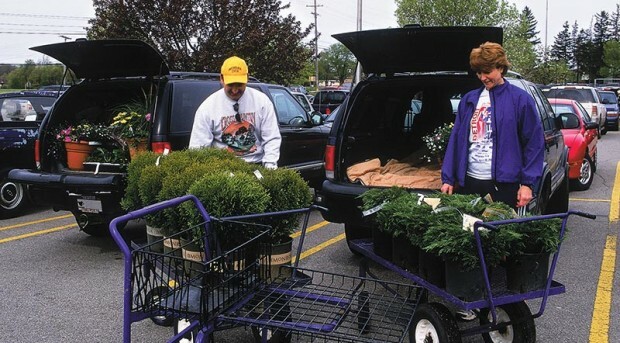 Plants can sit right in the wagon and there’s no danger that they’ll tip, which isn’t good for the plants and not so hot for the car’s interior either. And as long as I keep the outside of my bucket clean I can carry it right on the front seat, filled with all kinds of hand tools. Kurt and Garnet Bowden of Oxford came prepared to the garden center one day this spring. “We do lots of home improvement things – that’s one reason we both drive SUVs,” says Garnet. Sometimes we drive borrowed or rented vehicles, or a car that significant others in our lives have designated off-limits for gardening ventures. Yet horticultural opportunities crop up at unexpected times. When that happens, what we’ve learned in sanctioned garden-mobiles can pay off in spades. Perhaps what you’ve seen and read here will come in handy when you pack for your next gardening field trip. But every time you get behind the wheel, keep at least this last thought in mind. Since forty percent of the population has garden fever, many of the cars around you at any given time are being driven by gardeners. That’s a lot of people keeping one eye on the shoulder, studying landscapes and gardens while they drive and taking corners at unpredictable, subdued speeds lest their plants tip. At least a few of them may also be prone to sudden starts of alarm when shifting boulders go ‘thud’ in the trunk. So always be prepared for unexpected moves by fellow mobile gardeners, and do your own garden packing carefully so you can keep your attention on the road! Previous Post: China plans to build a $100 million garden in Washington D.C.
Tulip poplar is a huge but interesting tree. It too has showy, tulip-like flowers once the tree matures (25 years), and has a deep yellow fall color. The drawbacks are its size and that it has weaker wood like most poplars, causing it to be more prone to storm damage. “Tulip poplar” refers to Liriodendron and “most poplars” refers to Populus. We could have made that clearer. Thanks for your feedback, and thanks for reading Michigan Gardener!